Tower Grove Avenue next to the Botanical Gardens is a jewel of a road, with wide right lanes and no intersections. Cars usually drive in the left lane and cyclists on the right, with plenty of clearance from parked cars. Its relative safety and convenience are a big reason Tower Grove Ave is the busiest cycling route in St. Louis. 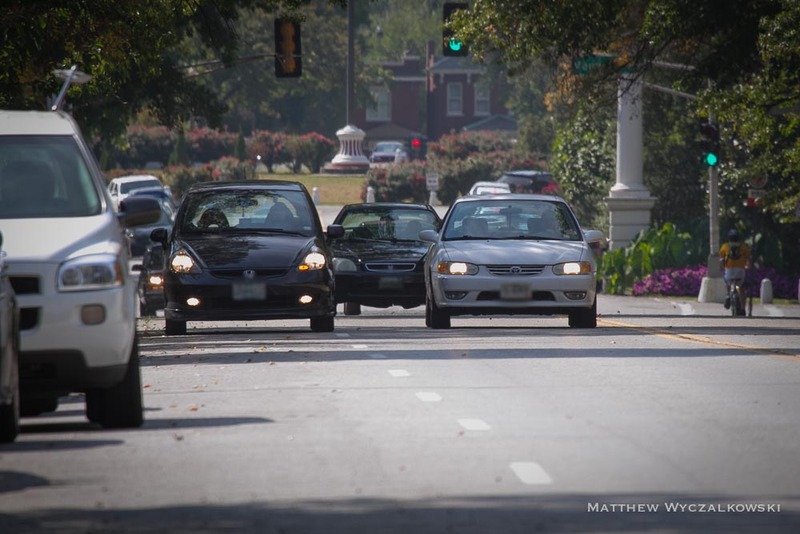 Cars take the left lane and cyclists take the right on Tower Grove Ave next to the Botanical Gardens. This safe and enjoyable arrangement helps make this road a key St. Louis bicycle corridor. During periods of heavy traffic cars will sometimes drive in the right lane, and this “bike lane” arrangement breaks down. Such driving, often aggressive, is alarming and intimidating to cyclists, and creates particular danger when approaching parked cars. Heavy traffic and right-lane driving pose a real danger to the viability of Tower Grove Ave as a safe and popular cycling route. In heavy traffic cars will sometimes drive in the right lane. Such aggressive driving is intimidating and dangerous, particularly near parked cars. 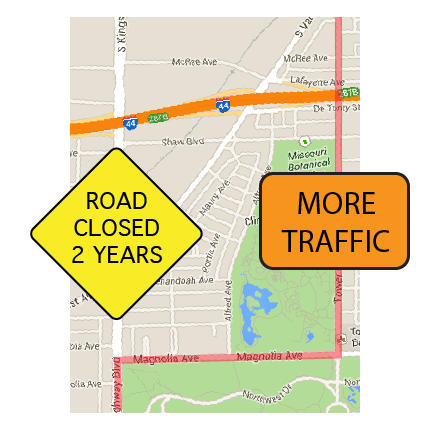 Unfortunately, the upcoming closure of Kingshighway to replace an aging bridge will significantly increase traffic along Tower Grove Ave, but the current plan is to keep the lane arrangement on Tower Grove Ave unchanged. As a result, these hazards for cyclists are likely to only get worse for the next few years, changing the character of the road and making it unsuitable for all but the most fearless riders. Starting in late 2014 Kingsighway Blvd will be closed for two years between Vandeventer and Shaw to replace the aging viaduct. Traffic along Tower Grove Ave will increase as a result. There are solutions, however. Dedicated bike lanes can improve safety and comfort for cyclists by enforcing the arrangement that works today: cars in the left lane and bicycles on the right. 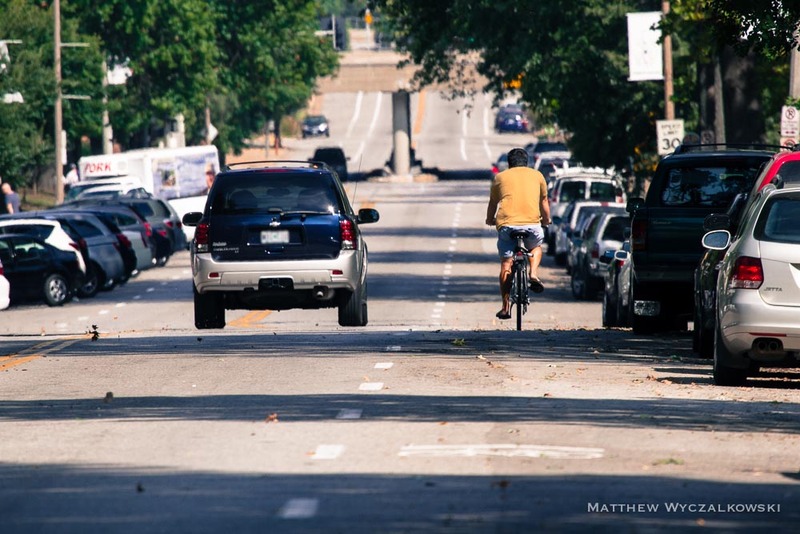 A dedicated bike lane will calm traffic and make the road safer for all users, preserving its unique character for cyclists, pedestrians, and residents during the Kingshighway closure and for years to come. Tower Grove Avenue is slated to get buffered bike lanes as part of the Bike St. Louis Phase 3 project. However, we recently learned from people involved in the project that bike lanes on Tower Grove are to be delayed indefinitely, presumably to improve traffic flow when Kingshighway is closed. When I talked to him a year ago, Alderman Conway was strongly opposed to bike lanes until the Kingshighway project is complete. (I am waiting to hear back about his current position). Unless something changes, for two years Tower Grove will have no new bike lanes and become much more dangerous to ride on. A dedicated bike lane would preserve the current arrangement even in heavy traffic, restricting driving to the left lane and protecting cyclists’ space on the right. The case of Tower Grove Ave illustrates in a nutshell how driver convenience is reflexively prioritized over cyclist safety. And it is more than just cyclists being intimidated – the developing Cortex district has committed itself to the idea that being more accessible to cyclists and pedestrians is critical to being competitive on the national and international stage. Delaying bike lanes to speed traffic subverts all of this. 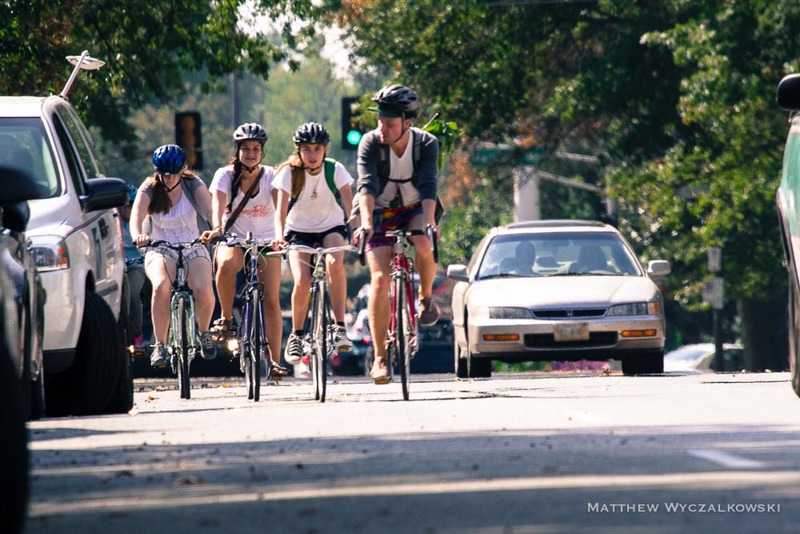 If you feel that dedicated bicycle lanes should be in place before Kingshighway closes, please share your thoughts with Alderman Stephen Conway, the Streets Department, and your Alderman today. Your voice really will make a difference. Thanks for these thoughts; I’ll be sharing these concerns with all of the above. In addition to creating bike lanes on TGA, it would be helpful to improve alternative north/south routes near this corridor. Macklind to the west is largely bike friendly (though I’m at a loss for the best N/S route west of that). 39th St. could be improved with some resurfacing and by making Chouteau a bike-friendly connector between Grand and Vandeventer. And access to 39th could be improved by making Tower Grove Park, and TGA along Shaw, more bike friendly to those of us who can’t hop gutters and curbs. Tower Grove Avenue will become more bike friendly if alternate routes (for traffic of ALL kinds) are easily available when needed. Good comment and I agree the dedicated lane needs to start at Magnolia. But I fear that even the dedicated lanes are not safe enough. Yesterday for example was an afternoon of just crazy-@*@! @(# drivers weaving into and out of the bike lane (b/w Shaw and Vandeventer) and many drivers seem not to now that they aren’t supposed to be there or just don’t care. A lot of school children are now using the bike lane and we need safe street infrastructure. I am not sure of what the solution is (occasional police enforcement? installing educational message boards for a period?) but something needs to improve. Cyclists should be writing our community leaders and elected officials more often. 1 Pings/Trackbacks for "Tower Grove Ave: A Case for Bike Lanes"